Frozen Lunch Review! 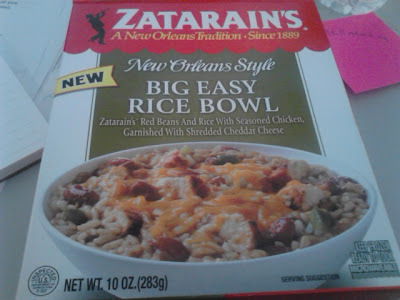 Zatarain's Big Easy Rice Bowl | The Food Hussy! I'm really trying to save money and one of the biggest money-wasters for me is eating out at lunch. When I started my new job - it just became a habit and I was out probably 4 days a week! That was just too expensive so I'm transitioning to eating lunch at work. While I like to cook and bring leftovers - life right now is a little insane - so I've been in frozen meal land - which isn't so bad. I'm also a couponer - so I try and get deals whenever possible. With all of this - I've decided to review the lunches - and hopefully find out from you what your favorites are so I can try those! We all know - some are awful and some are pretty damn tasty! First up - Zatarain's Big Easy Rice Bowl. I think the package shot is key because how much like the package does it really look? And seriously - who ever takes their frozen stuff out of the package and puts it in a real bowl???? 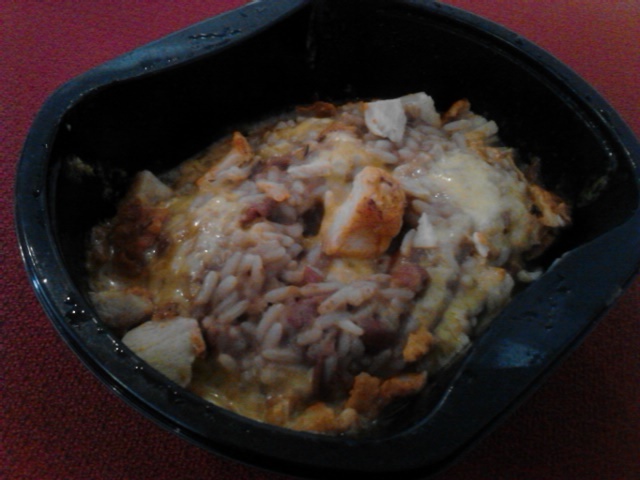 This is red beans & rice with chicken and cheddar cheese. I chose this because it's different than the typical pasta and I had a coupon. Here's the outcome - not quite like the package - but nothing ever is. Flavor - as usual with frozen meals - it was screaming for salt! Other than that - it tasted fairly close to what their regular packaged red beans & rice tastes like. Meat - The chicken tastes like chicken - sometimes frozen meals have a funkity funk texture - this one was really good on that front. Cooking - The cheese sticks to the sides a bit but doesn't get hard and inedible at all. Fullness Factor - as usual I need a side item to really feel full. I usually bring fruit or a snack. But it didn't leave me starving - so that's pretty good! Also - if you're with me in the world of packing lunch and saving money - check out Lunch It Punch It - when you hit 10 packed lunches - you can go out to eat! Great idea and Cincinnati-owned! I hope some of you will share your favorite frozen dinners or quick lunch ideas with me! Did you mean screaming with salt or screaming for salt? Really like the lunch review idea!! Screaming FOR salt - they're always lacking in it. 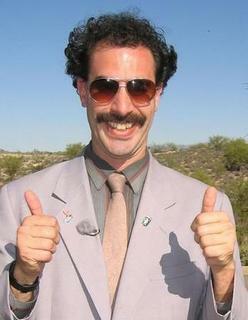 I'm always slow to make the rounds thanking friends for the shout out...I'm glad you're doing these reviews!